Despite the widely recognized importance of disturbance in accelerating the loss of elements from land, there have been few empirical studies of the effects of natural disturbances on nitrogen (N) dynamics in forest ecosystems. We were provided the unusual opportunity for such study, partly because the intensively monitored watersheds at the Hubbard Brook Experimental Forest (HBEF), New Hampshire, experienced severe canopy damage following an ice storm. Here we report the effects of this disturbance on internal N cycling and loss for watershed 1 (W1) and watershed 6 (W6) at the HBEF and patterns of N loss from nine other severely damaged watersheds across the southern White Mountains. This approach allowed us to test one component of N limitation theory, which suggests that N losses accompanying natural disturbances can lead to the maintenance of N limitation in temperate zone forest ecosystems. Prior to the ice storm, fluxes of nitrate (NO3 −) at the base of W1 and W6 were similar and were much lower than N inputs in atmospheric deposition. Following the ice storm, drainage water NO3 − concentrations increased to levels that were seven to ten times greater than predisturbance values. We observed no significant differences in N mineralization, nitrification, or denitrification between damaged and undamaged areas in the HBEF watersheds, however. This result suggests that elevated NO3 - concentrations were not necessarily due to accelerated rates of N cycling by soil microbes but likely resulted from decreased plant uptake of NO3 -. At the regional scale, we observed high variability in the magnitude of NO3 - losses: while six of the surveyed watersheds showed accelerated rates of NO3 − loss, three did not. Moreover, in contrast to the strong linear relationship between NO3 − loss and crown damage within HBEF watersheds [r 2: (W1 = 0.91, W6 = 0.85)], stream water NO3 − concentrations were weakly related to crown damage (r 2 = 0.17) across our regional sites. The efflux of NO3 − associated with the ice storm was slightly higher than values reported for soil freezing and insect defoliation episodes, but was approximately two to ten times lower than NO3 − fluxes associated with forest harvesting. 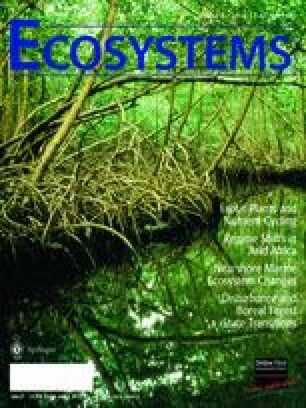 Because over one half of the entire year’s worth of N deposition was lost following the ice storm, we conclude that catastrophic disturbances contribute synergistically to the maintenance of N limitation and widely observed delays of N saturation in northern, temperate zone forest ecosystems. Present address: Department of Ecology and Evolutionary Biology, Princeton University, Guyot Hall, Princeton, New Jersey 08544, USA. We are grateful to Frank Berondse and three anonymous revisners for helpful common on this paper. We are thankful to K. Wiley, B. Dresser, C. Wood, Adam Welman, and Jason Demers for sample collection and/or analysis. This study was supported by the National Science Foundation through the LTER and LTREB programs. We are indebted to the USDA Forest Service for use of precipitation and hydrology data. The Hubbard Brook Experimental Forest is operated and maintained by the USDA Forest Service. This is a contribution to the Hubbard Brook Ecosystem Study.